High density polyethylene, or HDPE is the sturdiest and most inflexible type of polyethylene that can be used for a wide range of applications. HDPE is defined by a having a density greater than or equal to .941 g/cm3, and represents the most common portion of the polyethylene applications. Virgin HDPE is non-toxic and non-staining, and offers excellent impact resistance, a light weight, low moisture absorption, and a high tensile strength. Reusable packaging manufactured with 100% virgin HDPE is perfect for use in food processing, confectionery and pharmaceutical applications due to its non-toxic properties, which are compliant with the USDA’s requirements for direct contact with ingredients and/or food products. Reusable packaging made of virgin material can be seen in colors natural / off white, gray, and practically any color available. It is the color black that should act as a warning signal for whether the container or HDPE-made product is manufactured with virgin material, because it is a black or off-black color that is seen in products made of recycled HDPE resin. Many of the benefits that virgin HDPE has to offer can be experienced through the use of recycled HDPE. As the resin has improved over the years, users of reusable packaging produced with recycled HDPE can enjoy longer lifespans and increased durability. However, it is extremely important to note that reusable packaging manufactured with recycled resin does not meet USDA requirements for direct contact with ingredients and/or food products made for human consumption, and now increasingly with animal / pet consumption. The rational is that recycled resin may come from a container used in a facility or environment such as a fertilizer plant or other waste facility – the history of the resin used in recycled HDPE reusable packaging just is not known. Be advised that if you are using containers in a food processing, confectionery or pharmaceutical environment that containers can be manufactured with just a portion of recycled resin and still maintain a color other than black. This practice will make the seller of the plastic container or product more competitive, but you must utilize a plastic liner to prevent direct contact with the container. All it takes is one visit from the USDA and one plastic bin sample showing resin is not 100% virgin to cause BIG problems. Be sure to receive confirmation that the bin or pallet you seek to purchase for your USDA needs is USDA compliant by requesting the MSDS sheet and certificate showing the plastic resin is FDA approved. Containers and reusable packaging manufactured with recycled HDPE resin are ideal in industrial settings where products or ingredients that are not at risk for contamination. Users of reusable packaging made of recycled HDPE may also experience shorter lead times, as used or refurbished items are more likely to be readily stocked and available to ship at a moments notice. 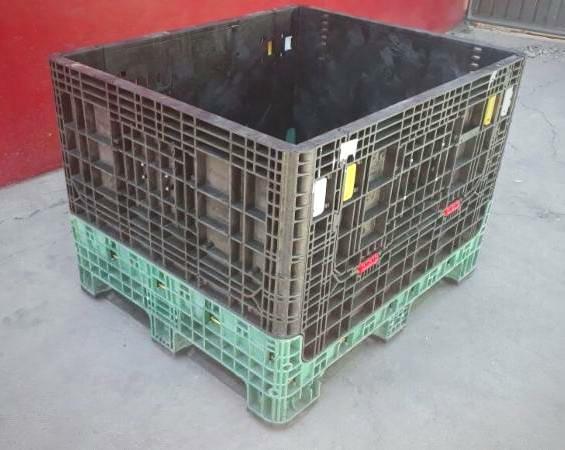 AIM regularly stocks refurbished plastic knockdown bulk boxes (with 2 drop gates), many of which are a mix of different colors; some being all black. Sizes vary based on height and footprint, the most common LxWxH dimensions being 45x48x34, as this is – by far – the most commonly used footprint for knockdown containers nationwide. Other knockdown footprints do include 48×40 and 32×30. Heights will vary from 25″ high up to 50″ high. Utilized in industrial manufacturing setting. Designed with compartments for individual part placement. The blue plastic corrugated seen above is likely made of virgin material, as the plastic pallet and top cap is made of recycled material. Also visible is the curtain used to cover and protect each opening from dust and other particulates. Manufactured via rotational molding, creating thick corners to resist cracking, typically with FDA approved material. It takes roughly one hour to complete a single bin, but it’s strength and durability allows this bin to last for years. The bottom interior surface is flat to make cleaning easier, and plastic welding and repair easier. After years of repeated use your bins may experience cracking and scraping. AIM’s professional plastic welding staff will take your damaged bins and refurbish them to like new condition, allowing you to extend the life of your bins at a reasonable cost.